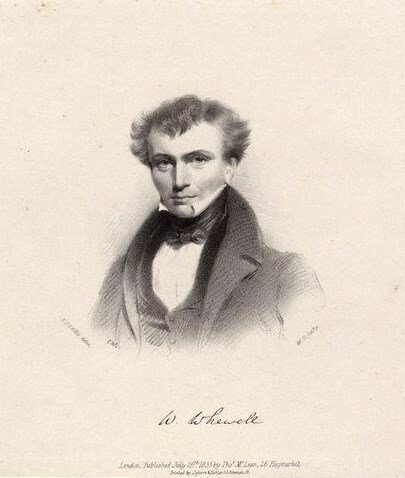 Happy Birthday, William Whewell (1794-1866)!! On this date in 1794, the British natural philosopher, mathematician, all-around polymath (and inventor of the word “scientist”) William Whewell was born. I first heard of Whewell in my first year of graduate school, and it is no exaggeration to say that the event changed my life: it led me to write my two books, and indeed to change course in my scholarship, as well as helping to bring about my dream of writing books that people other than scholars would want to read. The first time Whewell was mentioned in my presence was in a lecture on philosophy of science. Whewell was then mainly known (if at all) as the foil for the (now) more famous British philosopher J.S. Mill. Whewell and Mill famously disagreed about scientific method. Philosophers of Science would at that time routinely refer to Mill as the “winner” in their debate, the one who better understood how science actually worked, casting it as an argument between an inductive view of science and a non-inductive viewpoint, with Whewell in the role of the non-inductivist. I couldn’t help but wonder why a non-inductivist would write a book called Philosophy of the Inductive Sciences! This led me to an intense study of the two philosophers, which resulted in my first book, Reforming Philosophy: A Victorian Debate on Science and Society. I argued there that, in fact, Whewell was proposing an inductive, evidence-based scientific method, in the tradition of Francis Bacon and Isaac Newton. Mill was changing the meaning of induction by introducing a vision of inductive reasoning that held it impossible to have knowledge of anything unseen, such as the unobserved entities and properties part of any scientific law. Mill was the one who did not understand the way science worked. Mill was not particularly concerned about scientific method; his massive and mostly misunderstood work, A System of Logic, was written as a political tract. The English author and critic (and father of Virginia Woolf) Leslie Stephen said the book was recognized by students of the time as being a treatise on the Utilitarian moral and political philosophy. In Reforming Philosophy I argued that Mill’s scientific method was meant to counter what he considered to be reactionary political and moral views—such as those he, somewhat unfairly, associated with Whewell. So in that book I examined not only the scientific and logical views of Mill and Whewell, but also their positions on moral philosophy, politics, and economics. That interdisciplinary approach brought me back to my origins as a student not only of philosophy but of history, and particularly the history of thought. The research for that book also led me to a letter received by Whewell when he was Master of Trinity college–a letter that referred back to the “philosophical breakfasts” held in John Herschel’s rooms. A few years later, I finally had the opportunity to write that book, and to write it the way it should be written—in an accessible narrative style. And since the publication of The Philosophical Breakfast Club, I’ve had the opportunity to talk to many people about Whewell and his friends, and the revolution in science they helped bring about. This relationship with Whewell has brought me to a wonderful place in my life. So, for selfish reasons, I celebrate his birthday today. https://i1.wp.com/laurajsnyder.com/wp-content/uploads/2014/09/WilliamWhewell.80x80.jpg?fit=80%2C80 80 80 Laura J. Snyder http://laurajsnyder.com/wp-content/uploads/2019/04/Laura-J.-Snyder.2074x340.png Laura J. Snyder2012-05-24 11:25:172014-09-16 23:45:16Happy Birthday, William Whewell (1794-1866)! !